Jenolan Valley View - resort style/budget price. Halfway between Katoomba and Jenolan Caves. Please be aware that the pricing provided by the Homeaway is not always correct especially for mid week hire where pricing is for a couple - see the pricing structure below for a better idea of the cost involved for your group. We will finalise costs with you after contact has been established. We do not give instantaneous bookings as we need to check details with guests before taking a booking. Please click 'Contact Owner' NOT the "Request to book' button. Please also be aware that we need to vet groups wishing to visit carefully due to our commitment to not allowing the house to be used by large party groups and we will communicate with you prior to confirming the booking. We will get back to you within 24 hours. We also understand that people wanting our style of accommodation often need some back and forth communication to ascertain what extras they need supplied so an accurate amount can determined and considered before deciding to book. Group pickups from the local railway stations are available on weekends and holidays. WE PRIDE OURSELVES ON PROVIDING A LOCATION FOR FAMILY AND FRIENDS THAT ALLOWS PEOPLE TO RELAX, ENJOY EACH OTHERS COMPANY AND COMMUNE WITH NATURE. THIS HOUSE IS NOT A PARTY HOUSE AND WE DO NOT PERMIT GROUPS TO BRING UP THEIR OWN LOUD MUSIC EQUIPMENT OR CONDUCT ROWDY GATHERINGS OUTSIDE AT NIGHT - IF YOU HAVE THIS IN MIND THEN PLEASE DO NOT ENQUIRE. Jenolan Valley View is only let to single groups so you will not be sharing with other people. Some people worry about bushfires in the mountains during summer. Jenolan Valley View is ideally located in a mostly rural part of the mountains that has been unaffected by fire in living memory. It's an ideal location to come to the afternoon before you go to the caves. Spend the afternoon by the pool taking in the wonderful sunset. You will be up and at the caves before most have left the mountains, you can then use the rest of the day to visit Kanangra Walls near the caves. For future bookings please email using the 'Contact Owner' facility. We will get back to you within 24 hours. Please note that we are a properly registered operator and we can not allow pets to stay due to municipal regulations and because of the ongoing shared nature of the premises, health regulations and in the interest of other guests we cannot accommodate pets or smoking inside. Also please note that we do not let to groups with non-swimming children due to the nature of the pool and dam on the property. Jenolan Valley View is ideally positioned part way along the famous Greater Blue Mountains Tourist Drive. It is near the start of Jenolan Caves road being rated one of the top 5 road bike rides in the country. It is less than 2hrs from most of Sydney and 1.5 hours from Western Sydney. You can get here easily after work on a Friday night and be ready to start your weekend first thing Saturday morning. 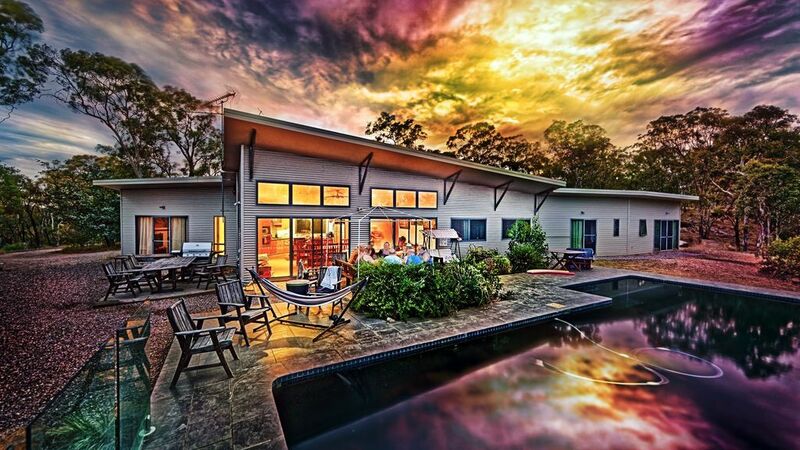 Jenolan Valley View is a 5 bedroom resort style home perched high on a cliff with spectacular views of the valley below. We can supply all bedding or you can bring your own. If you want to cook your own meals then there is full kitchen facilities and an outside BBQ. The large town of Lithgow with its supermarkets, restaurants and clubs is only 10 minutes drive or you might want to have a meal at one of the very charming local country pubs that are also only a short drive. The 'Workies' club in town is renowned for its pleasant atmosphere and huge well priced meals. There is perfect telephone reception for all mobile carriers providing reliable hot spot internet from Jenolan Valley View. Everyone wants to visit the 'big three' - Three Sisters, Scenic World, Jenolan Caves. In Katoomba there is the world famous 3 Sisters and Scenic World with the skyway, railway and cableway. Jenolan Caves is the most visited inland tourist attraction in the State and consistently receives best tourist attraction award. The views on the drive in alone are worth the trip. Jenolan Valley View is exactly half way between the Katoomba and Jenolan attractions. We have numerous day trip posters with directions and maps for use while visiting the property and we can provide detailed information about these so you can plan your weekend ahead of time. We can also supply various itineraries depending upon your length of stay - these will ensure you miss nothing while up here. Our basic pricing is designed to keep prices affordable for all. It does not include linen, towels or toiletries. If you would like to have these supplied than we can do so - see the pricing below. Room 1 and 2 .....The family suite has one larger and one smaller room. A large family or 2 couples can sleep in this space - shares the main house bathroom. Room Arrangement - all beds in the house are singles (they are rolled together if a double is required. Please note that a Saturday/Sunday night visit incurs the full weekend rate. Rates for visits that include Easter ,Christmas and New Years need to be confirmed. A 20 percent discount applies to weekend bookings made less than 2 weeks before the visit - excluded are some prime weekends. A 10 percent gst will be calculated with booking enquiry once optional extras are determined. GST exempt groups need to provide required documentation. This pricing is for up to 12 people. If you have more people than this then there is a $20 / person charge / night of stay. This is a minimal charge to cover water, electricity etc - these things are very expensive to supply to a rural property. We have a 'room only' option where the rest of the house is locked off and you get the use of a room with an ensuite. Visitors using this option will not have access to kitchen or lounge facilities so would have to eat out locally somewhere. The pool, outdoor area and garden seating is still available to 'room only' visitors. For school holidays, long weekends and festive holidays please check for prices as they vary from the prices quoted here. Check out is 11.00am - gives you plenty of time to soak up the ambience on your last morning. The rooms - note all beds in the house are singles, they can be pushed together to make doubles. The beds in the 3 larger rooms have a quality mattress trundle in case you would like a 3rd or even 4th person in the room. It would be cosy but quite possible. We supply mattress protectors, pillows and a quilt. You can bring your own bedding and linen if you like. You will need to bring king-size double sheets or single sheets depending on how you wish to make up the beds. Payment for your stay at Jenolan Valley View is accepted by bank or internet transfer - details supplied with finalised booking request. It was a great stay, however, we felt a level of distrust and obtrusiveness by the owner as he would come and check on us at very strange times, such as 9.30pm to say he was cleaning the pool. Other than that, had an awesome time! Just would've appreciated a warning or question to confirm it was a fine time for him to come. We clearly state in all of our communications and when people arrive that we need to attend to the pool each evening after guests have finished with it and that we are very careful to monitor the situation at the house, especially when there are large groups of young people. This group was quite well behaved but had more than the agreed number of visitors and despite our strict 'NO PETS' policy brought a dog that was taken inside the house. We try to be as discreet as possible but as responsible providers, we must ensure the house is used correctly - the majority of people have no problem with this but if groups are uncomfortable with that situation then they are likely the groups we are keen to discourage. We’re a family of 8 who spent our 2018 Christmas week at this beautiful home. Everyone loved the infinity pool.. swam everyday and basically all day. Love the view day and night. It was a full moon 2-3 days that week and the moonlight over the pool and valley was priceless! Games room was fun but we mainly spent our time by the pool. We never left the house from Christmas Eve Monday-Friday.. everything we needed was right there. Highly recommend it to anyone wanting to just get away and relax! Thank you so much to Greg & Kathy for the accomodation & easy communication. Thanks for the lovely comments and hopefully we can assist you with another visit in the future sometime. We stayed with a group of friends for a quiet weekend. Watching the clouds and sunbeams over the Hartley Valley was delightful. The house is well set up for a large group (there were 12 of us). A great weekend. My family and i had a wonderful time in Good Forrest. The best part of the stay was the games room the pool and the view. It was winter but the the pool was so inviting and we will be going again in the warmer months and did i mention the view. The kitchen was fully decked out for a big family and the view. Amazing views and fantastic house. We will be back!